The third composer of the Viennese Classic is also the bridge to Romanticism and was born in 1770. His family was of Flemish origin, thus the funny name. In 1778, Ludwig van Beethoven starts to perform - pushed by his father, who would love to see little Ludwig as a wunderkind like Mozart. However, Beethoven turns out to lack the talent and fails to attract much attention for the time being. In 1782, Beethoven starts to receive formal training in music from Christian Gottlieb Neefe. He learns piano and studies music theory. In 1787, Beethoven tours Vienna for performances, but has to quit after his mother become ill. His father is an alcoholic. In 1792, Beethoven goes to Vienna for the second time and takes lessons from Joseph Haydn, Johann Baptist Schenk and Antonio Salieri (the bad guy from the movie "Amadeus"). Two years later, Napoleonic troops occupy Cologne where Beethoven had lived before. Partly as a result, he decides to stay in Vienna as a freelance composer and teacher. In 1793, he and Joseph Haydn travel to Eisenstadt. 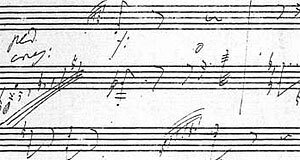 In 1798, his hearing problems first become obvious - Beethoven becomes increasingly deaf. Nonetheless, his most productive years follow with his famous symphonies: The third or "Eroica" in 1805, the hugely successful thifth and sixth symphony in 1808. In 1809, three high-ranking noblemen sign a contract that guarantees a life-long maintenance pension for Beethoven. In the same year, Vienna is occupied by French troops and Beetoven recognises the dirty face of Napoleon - he changes his previously pro-revolutionary views. After the end of the Napoleonic Wars, the Vienna Congress brings golden times for composers: The high density of wealthy noblemen leads to many commissions and assignments for Beethoven and his colleagues. Balls, concerts, receptions and symphonies are on high demand. In 1815, Beethoven's brother dies and he takes the custody for his nephew. In 1819, he finally becomes completely deaf, a personal tragedy for the emotionally already troubled Beethoven. Nevertheless, Beethoven composes his 9th and most famous symphony in 1824. He dies from a liver disease in 1827. Worshipped as a national hero, 20,000 people attend his funeral in Währing. His body is later transferred to the Central Cemetery (Zentralfriedhof), where it now occupies a "Tomb of Honor" alongside with other famous Austrian composers (and the 1980ies pop-star Falco). A memorial site can be found in Baden bei Wien, where Beethoven spent a lot of time during the summers, when he wanted to flee the heat in Vienna. The district of Heiligenstadt in Vienna is the place where he wrote his famous "Heiligenstädter Testament", his will in which he mentions his mental problems and loneliness.